Apple has officially overtaken Samsung as the leader in global smartphone sales. In the fourth quarter, Apple reported its best results ever — selling 74.8 million units, helped by the release of the iPhone 6 and 6 Plus. Seeing 56% growth in China and 88% growth in the U.S., Apple finished the year with 20.4% of the smartphone market. Meanwhile, Samsung saw its market share drop to 19.9% in the fourth quarter of 2014 from 29.5% in the same quarter the year before. Samsung is trying to win back consumers, recently unveiling its new Galaxy S6 and S6 Edge smartphones. However, Cantor Fitzgerald analyst Brian White doesn’t expect the new phones to pose too much of a threat to Apple, according to TheStreet’s Gary Krakow. Worldwide sales of smartphones to end users had a record fourth quarter of 2014 with an increase of 29.9% from the fourth quarter of 2013 to reach 367.5 million units, according to Gartner, Inc. (www.gartner.com) Samsung lost the No. 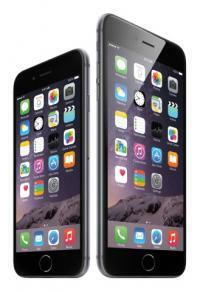 1 spot to Apple in the global smartphone market in the fourth quarter of 2014. Samsung had been in the top spot since 2011. Apple reported its best quarter ever in the fourth quarter of 2014, which saw it sell 74.8 million units and move to the No. 1 position in the global smartphone market. Apple’s first ever large-screen phones continued to see huge demand with sales in China and U.S., growing at 56% and 88%, respectively. Apple’s strong ecosystem and its new iPhone 6 and iPhone 6 Plus drove strong replacements within the iOS base, according to Garner. These new smartphones also offered new users, who are looking for larger screen phones, a strong alternative to Android. In 2014, sales of smartphones to end users totaled 1.2 billion units, up 28.4% from 2013 and represented two-thirds of global mobile phone sales. “With Apple dominating the premium phone market and the Chinese vendors increasingly offering quality hardware at lower prices, it is through a solid ecosystem of apps, content and services unique to Samsung devices that Samsung can secure more loyalty and longer-term differentiation at the high end of the market,” says Roberta Cozza, research director at Gartner.